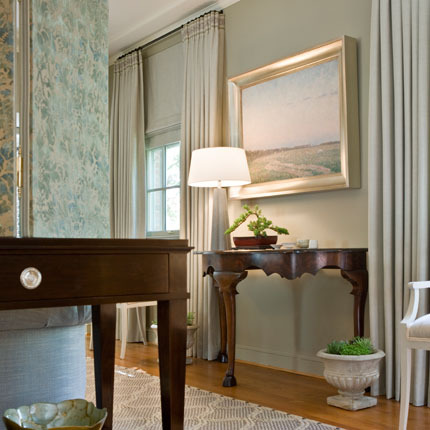 The experts in window treatments and upholstery for traditional, contemporary, and historic interiors. Knightsbridge Interiors, Inc. is a small, privately owned business, providing “Custom Window Treatments and Upholstery ” for an ever-expanding group of clients. Our products and services are geared to the residential and/or commercial interior designer seeking thequality features of residential window treatments. We work very closely with our clients to insure that we are providing products and services that will often exceed their expectations. With a workroom staffed with more than one hundred combined years of experience, and a network of suppliers from all over the U.S., Europe, and Asia, we feel we offer our clients the best custom window treatment services available. We have fabricated and installed custom draperies, shades, and upholstery for some of the most prestigious addresses in the United States. Although our main core of clients is in the metropolitan Washington, D.C. area, we routinely make trips to the Northeast, the west coast, the southwest, and throughout the mid-Atlantic region. We put a tremendous amount of time and experience into every job. Our goal is perfection. Our standard procedures are to review the desired treatments with our clients and our staff at the jobsite, before we make final determinations on how the treatments will be completed. Once our team agrees on the fabrication and installation plan, we begin. Although no custom finishes company is perfect, we feel that our experience, our techniques, and our overall understanding of our capabilities, allows us to reach our goal on virtually every job. Thank you for taking the time to visit our site. We hope we have helped you to understand who we are and what we can do to make your vision of custom window treatments and upholstery a reality. Please visit our Portfolio page to see some photos of recent work. We encourage you to Contact Us to set up an appointment.